Can You Put a Sunroom on Top of Decking? If you have a deck or are in the process of constructing a deck, you may consider adding a sunroom to enhance your living space. A sunroom should have subflooring installed underneath the base to provide stability and a proper foundation for supporting the sunroom. Most sunrooms need to be installed on top of a concrete slab foundation, but exceptions can be made if the decking is reinforced or rebuilt to meet code and the construction specifications. There are several different sunroom types and styles. The larger the sunroom, the greater support it needs. Some sunrooms such as four-season rooms and conservatories are engineered to have complete stability through concrete slab reinforcement. Four-season rooms are fully insulated and are surrounded by several windows and distinct, contemporary design. Because sunrooms require full electrical and HVAC hookups, the base of the sunroom must meet code by having concrete poured to the dimensions of the room prior to the build or assembly. Smaller sunroom types including partial glass rooms, or rooms made of vinyl, or aluminum, may be able to be built on a deck, as long as there is reinforced support underneath. Ideally, you should have your deck built as part of your sunroom package. Your contractor will design your deck with your sunroom in mind. He may reinforce the base with concrete underneath the sunroom and build the deck around the sunroom. This will assure that the sunroom is stabilized and reduce the risk of collapse or warping due to rotting or weakened wood. Tiered decks that house the sunroom will provide stability to handle the weight load of the sunroom and other items that may be included in the project such as stairs, benches, or a hot tub. The main advantage of having your sunroom built onto your deck is to create a flawless design. Most sunrooms are built for the back of your home and provide an asset to your backyard living space. They can be close to a pool or pond or other architectural features of your yard. Because a sunroom is often built directly off of your home, the deck provides easy access in and out of the sunroom and into the backyard. Unless you are a licensed builder or contractor, you should not attempt to install a sunroom on your existing deck without professional guidance. Depending on the age and condition of your existing deck, you need to make sure the deck is able to withstand the added weight disbursement. 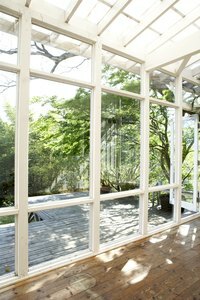 Treat your sunroom like you would any new wall or room in your home. It will have to be engineered specifically to the dimensions and materials of the sunroom. Failure to do so could result in deck collapse or shifting in the sunroom construction.